One of the wonderful things about having a passion for films is that there is always another gem that you never got around to seeing. Over 50 years after it was made, I have finally sat down and watched Federico Fellini’s La Dolce Vita. The film’s ironic title, “The Sweet Life”, is perfect for this fascinating study of the restless central character, newspaperman Marcello Rubini, and the places and people he visits in his quest for fulfilment. Fellini’s film is incredible in its imagery, characters and stories. La Dolce Vita is an examination of a particular society in a particular time and place. However, the parallels 50 years on with where I live – bar the religious element – are shockingly transparent. Once seen, it is very interesting to read up on the allegory that is La Dolce Vita and the symbology and symmetry Fellini employed to put across his ideas. Rubini’s sometimes side-kick in the story is Paparazzo, an intrusive photographer. It was after La Dolce Vita was released that the term “paparazzi” became widely used. You can find more information on this Italian movie on Wikipedia and IMDb. It is a masterpiece,-decadence of post-war Italy is as relevant to us as then. I have posted my appreciation in my Movie Lists which discusses at length my personal views. Thanks for your post. That was a very interesting read, Benny. Many thanks! Excellent! It’s a powerful film. Do leave a comment after you’ve watched it, please. Thanks for helping to keep this wonderful old movie alive and in our memories. My Father-in-law loved this movie. I only saw part of it but I may have to check it out further. It’s a masterpiece – so absolutely no reason not to give it a try! I haven’t been able to watch this because Netflix doesn’t have the subtitles straightened out. I could only see one line. I am dying to watch it though. Shimky, thank you for following.I just retaliated your gestures. Your review is an interesting perspective of what ♏y site represents. I wish I had more films that represent international development issues, I will be glad to work with it. Will keep checking on you. Yes, this is one of those ‘classics’ that I still haven’t gotten the chance to watch yet. 8 1/2 is probably my favourite movie of all-time! This is one of my all time favourites!! 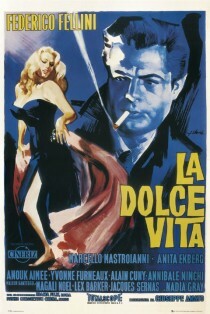 My favorite film of all time & Fellini is my favorite director! I have to mention Nino Rota’s amazing score and a stellar performance from Marcello Mastroianni. data on the topic of my presentation subject matter, which i am going to present in college. really … what can you say? a true classic in every sense of the word. an absolute must-see!